Although the progressive community has been aware, for more than a year, of the water quality crisis in Flint that was created when the state-appointed emergency manager switched Flint from Detroit’s water system to a supply from the nearby Flint River, national attention is only now starting to focus on it. Today’s New York Times features an editorial denouncing the “depraved indifference” Governor Rick Synder’s administration showed toward Flint as the crisis unfolded. The basics of what happened are clear. Water from the Flint River is much more corrosive than that from the Detroit water system (from Lake Huron). Even though this water leaves the Flint processing facility fairly clean and appearing to meet most standards, its corrosive nature results in the pipes in the aged Flint distribution system corroding. Both iron and lead leach into the water as a result of this corrosion, leaving the water with a reddish-orange tint and unsafe levels of lead. Children in the area have already shown elevated levels of lead in their systems. Sadly, lead damage is irreversible. A bit of digging shows that the corrosive nature of the Flint River water comes from its high chloride content. [Note: free chloride ions (Cl–) are distinct from intact molecular chlorine (Cl2) and have very different chemical effects in the systems being described here. For brevity, they will be referred to as chloride and chlorine, respectively.] That high chloride content very likely results from heavy application of salt to roads during winter and subsequent runoff of the salt into tributaries and the river. The Flint River has a chloride content about eight or nine times higher than Lake Huron. Technical documentation of the Flint water crisis is almost entirely the work of a group of researchers directed by Professor Marc Edwards of the Department of Civil and Environmental Engineering at Virgina Tech (frequently updated at their website, flintwaterstudy.org). As the Times editorial noted, the Snyder administration tried to dismiss one group of critics as “anti-everything”. That won’t work with Edwards, who won a MacArthur Foundation Fellowship (often called a Genius Grant) in 2007 for his work on water quality. 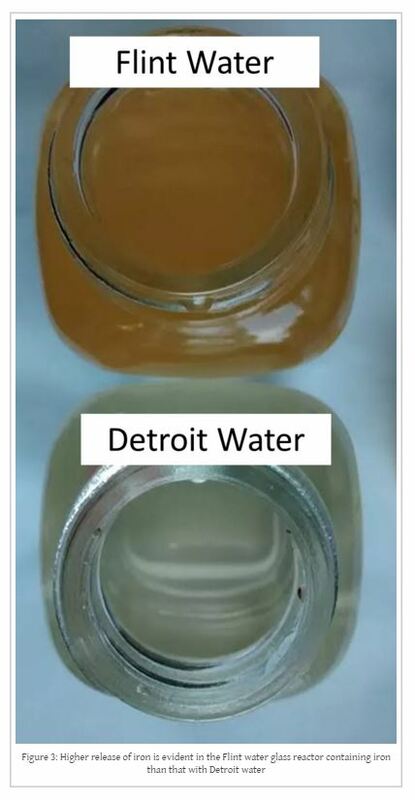 Flint water that has been in the presence of iron for five days takes on a reddish-orange cast while Detroit water does not. Image is Figure 3 found at http://flintwaterstudy.org/2015/08/why-is-it-possible-that-flint-river-water-cannot-be-treated-to-meet-federal-standards/ by Dr. Marc A. Ewards and Siddhartha Roy. The water in the Flint jar looks just like what we have seen in countless photos of exasperated Flint residents wanting something done about the poor quality of the water coming out of their taps. Leached iron by itself could well be the cause of this discoloration that is common in Flint. We will come back to this same study in a bit. 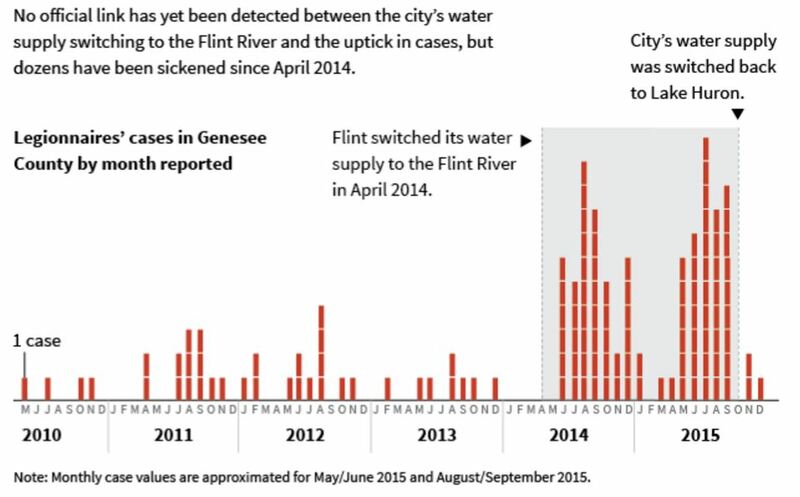 Huffington Post graphic depicting Legionnaires’ Disease cases in Flint and their correlation with the water source. Link: http://www.huffingtonpost.com/entry/flint-water-legionnaires-lead-crisis_us_569d09d6e4b0ce4964252c33 Graphic by Alissa Scheller. I’ve been having a rather unappetizing day today. It started out this morning, when I read that University of Michigan’s new Athletic Director would be Domino’s CEO David Brandon. Granted, Domino’s headquarters and UM are just spitting distance appart. Geographically. But I’m one of those who would prefer they stay a lot further apart on organizational issues. Then, in the wake of news that Lieutenant Governor John Cherry would drop out of the race to replace Jennifer Granholm came the news that Denise Ilitch was considering a run to replace Granholm. The Ilitch family is best known (and loved) as the owners of the Red Wings and Tigers. But their money comes from pizza–in this case, Little Caesars. Now, Ilitch has successfully run for statewide office as a Democrat before. After failing to get the Democratic nomination for UM Regent in 2006 (because her political donations suggested she wasn’t really a Democrat), she got the nod and the win in 2008. When she appeared at a rally with Obama last fall, Joe Biden called her the “First Lady of hockey,” so maybe there’s an anti-Palin angle to this. Now, when I first heard the rumor that some rich person from Detroit was thinking of running, I considered–then dismissed the possibility–it would be Denise Ilitch. I just didn’t think she had the long trust with the party that would win her support from the MDP. Whether that’s true or not, Chris Cilizza reports that Ilitch is being recruited. Now Ilitch may be a very talented person. Brandon may be able to bring new life to our athletic program. But MI is struggling out of one of its biggest crises ever–and in a time of crises nationally, it even still sticks out. Arguably, if you care about these things, so are UM’s big athletic programs as well. And the best response we have to those crises is … pizza? And pretty crappy pizza at that.